Brady, Conor and Seaver, Matthew and Barton, Kevin (2011) The Hill of Slane Archaeological Project. In: Recent Research in the Boyne Valley, a joint DkIT/UCD conference, 20 December 2012, Conyngham Arms Hotel, Slane. 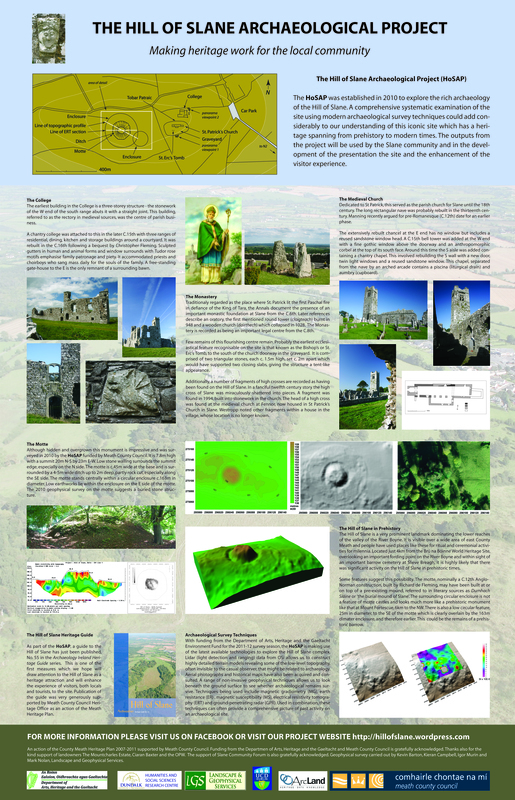 This poster is an introduction to the preliminary work carried out on the Hill of Slane Archaeological Project. 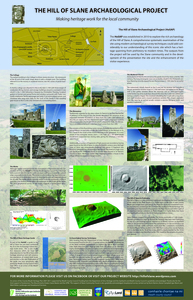 This represents the first survey of the Hill of Slane in modern times and as well as exploring the historical and mythological background to the monument complex, aims to use a range of new technologies including LiDAR (terrestrial and airborne), Worldview 2 multispectral satellite imagery, aerial photography, and geophysical techniques like magnetometry, earth resistance, ground penetrating radar, electrical resistivity tomography and magnetic susceptibility to explore the extent and nature archaeological resource.